VATICAN CITY (CNS) — On exam day, geology students might be handed a mystery rock to study, scratch and peer at, looking for clues to identify it and hypothesize about its origins and composition. On exam day at the Vatican Secret Archives, student-scholars get handed an obscure medieval manuscript to decipher, transcribe, analyze and hypothesize about its origins and historical context. “It’s an elite school” for highly specialized and difficult studies, said Bishop Sergio Pagano, prefect of the archives and the school’s director. It is so rigorous that only half of those who make it through a highly selective admissions process actually finish the two-year program and pass the final exams, he told Catholic News Service July 9. The Vatican School of Paleography, Diplomatics and Archive Administration was founded by Pope Leo XIII in 1884, just a few years after he opened the Vatican Secret Archives’ unique collection to the world’s scholars. He was looking to help experts in their search for the truth — by offering not just access to the Vatican’s immense wealth of historical materials, but also a chance to improve their reading and critical analysis of the treasures and minutiae they find within. That mandate still holds true, today, Bishop Pagano said, in a world that still risks sticking to the superficial. The Vatican school focuses on forming well-rounded professionals who can conduct research “critically, seriously and solidly based” on original sources, he said. “Meanwhile, people who do not have these qualities, they don’t know how to read documents, they don’t know how to assess them correctly and, therefore, they often run the risk of misunderstanding” what they see, he said. The bishop enrolled at the school in the 1970s when he was studying liturgy at St. Anselm University in Rome. “I realized that if you’re not able to read the codices, the old liturgical codices, it’s useless then to write a thesis, because you’re missing the actual substance” of what one’s trying to write about, he said. While the archives’ school was originally meant for clerics, it is open to all people of any nation and faith, as long as they are qualified in their field. Students can take a one-year program in archive administration or in Greek paleography, the study of ancient Greek and Byzantine handwriting. Only about 20 students a year get into the more difficult two-year program that walks them through the study of Latin handwriting; general and pontifical diplomatics, which is the critical analysis of documents; archive science; the study of wax and metal seals; and codicology — the study of books, manuscripts and codices as objects and how they are made. All course work is in Italian, and there are two five-hour final exams followed by an oral defense before a cardinal-led commission. “We’re very strict. It’s not easy to pass,” the bishop said. Despite such focus on getting the historical record right, no research publication is completely immune to typos and editing errors. During a presentation of a former student’s book in 1984, a Jesuit archivist reminded researchers to avoid quick shortcuts and always to go through the actual tomes themselves, no matter how dense, to get the real story. For example, he said, if someone were just to rely on scanning back-of-the-book indexes to gather information, they would be sorely mistaken when reading an early work analyzing the archives’ monthly income and expenditure reports during the pontificate of Boniface VIII. The research book’s back index incorrectly listed the Latin term “leopardus,” that is, the American continental puma — a very unlikely pet in a 13th-century papal menagerie. Instead, the book’s text correctly transcribed the upkeep of a “leopardo” or leopard — a feline more easily fetched from Africa or Asia. The leopard-related expenditures on the papal payroll included a chain “pro leopardo” for the cat; a crate “ad portandum leopardum” for its transport; a payment to repair the possibly overstrained chain; and a purchase in July 1299 to buy it a large quantity of meat. 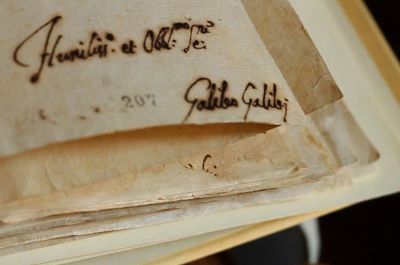 Accuracy about the historical record, even of such small details, becomes critical when dealing with sainthood causes, for example, or understanding controversial events like the Inquisition and the trial of Galileo Galilei. Getting the story right requires researchers who can decipher huge ranges of writing styles, curious abbreviations and marginal notations, ancient tongues and dialects as well as weed out a scribe’s mistakes and verify the authenticity of the document itself. It also calls for scientific rigor and an objective, interdisciplinary analysis to make sense of the once-deciphered text, the bishop said. 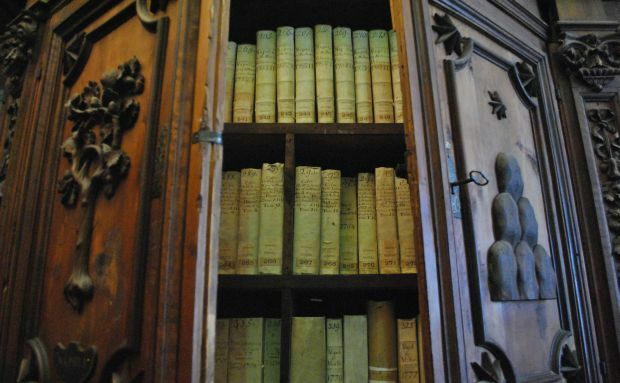 What makes the Vatican Secret Archives’ school unique, he said, is it is the only school in this field that can offer hands-on study of so many original ancient documents from its archives and the collections in the Vatican Library — totaling more than 80 miles of shelf space. “The good fortune of this school is having an archival patrimony that is so close, cohesive and can be used in the lessons,” he said. Bishop Pagano said a whole different field of scholarship will have to be developed to study today’s growing digital-only archives. 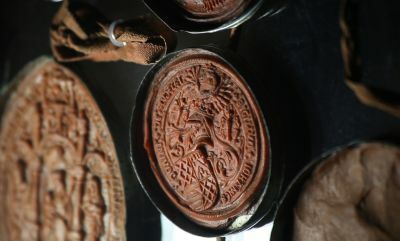 Just as stamps, seals and watermarks helped prove a parchment’s authenticity, digital trails and “fingerprints” will need perfecting to provide similar guarantees, he said. The biggest dangers to a digital archive, he said, is the data’s vulnerability to being corrupted, deleted or tampered with and to becoming unreadable, as formats are rapidly rendered obsolete. “I’ll stick to paper because if it’s written, I can see it, I can evaluate it,” he said. His advice: Anything of importance should “always be on paper” with multiple copies stored in separate locations. “”Never trust just computer technology to leave some kind of trace. Only the written word remains,” he said.